four years ago to the date, in the long long ago (aka 2009), my parents, little brother and i embarked on a small adventure through europe. 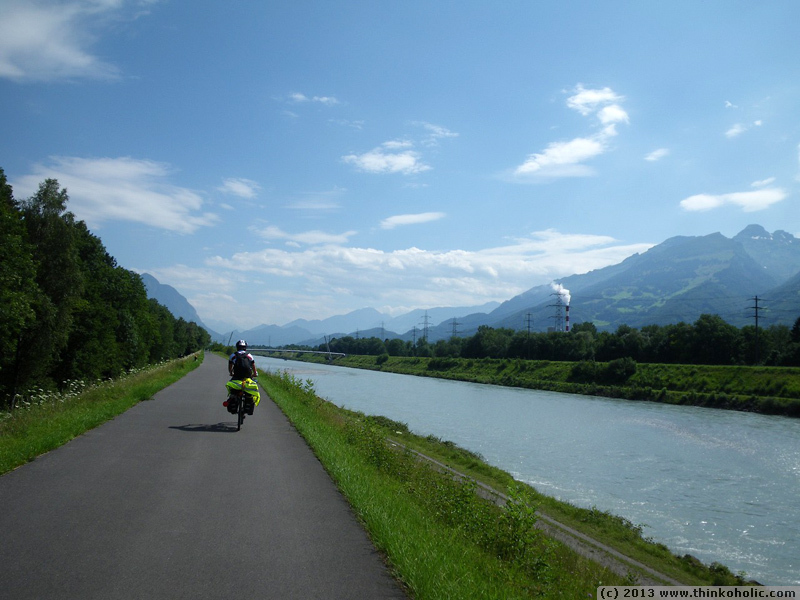 our goal was to get to denia (spain) right from our doorstep in rum/innsbruck (austria), using only our bicycles, while keeping the budget as low as possible. 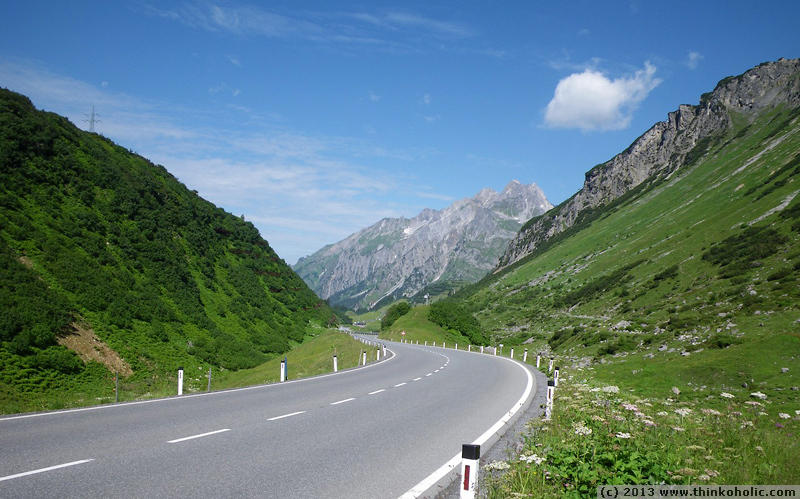 to make things a bit more interesting, we split up into two teams racing each other: team 1 (mom and dad) took a route through italy and france, team 2 (anton and i) went through switzerland and france. the team that would arrive at our destination first, would win. 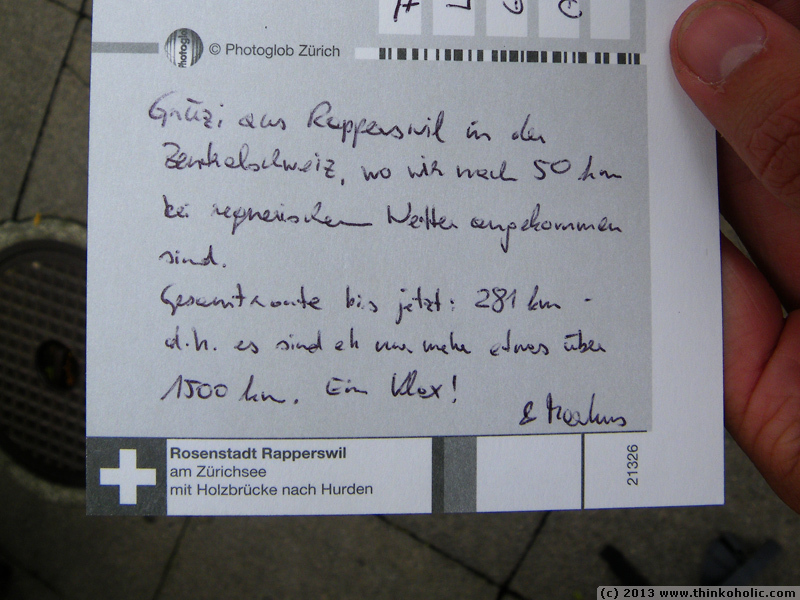 we sent a postcard home every few days to record our progress along the 2200 km journey and prove when we were where. 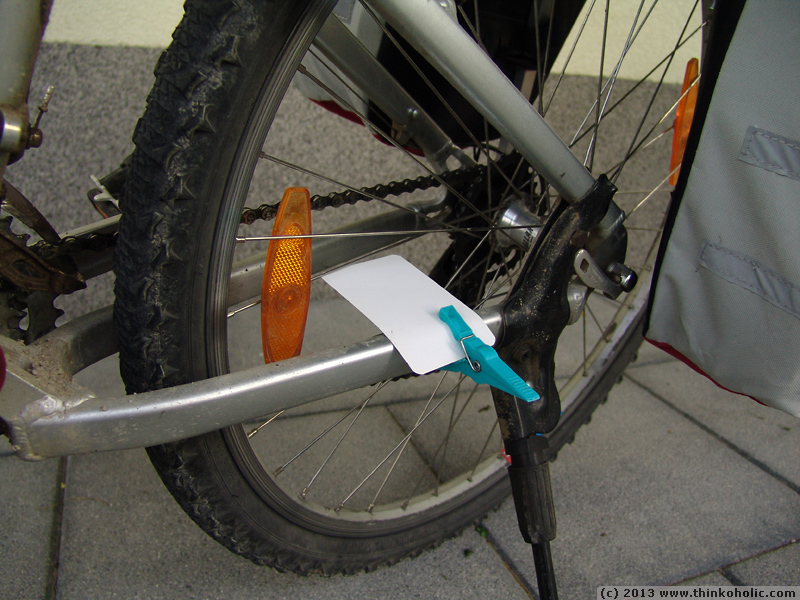 the two teams set out on their quest on july 12, 2009, equipped with basic self-printed 100 km map segments (incl. 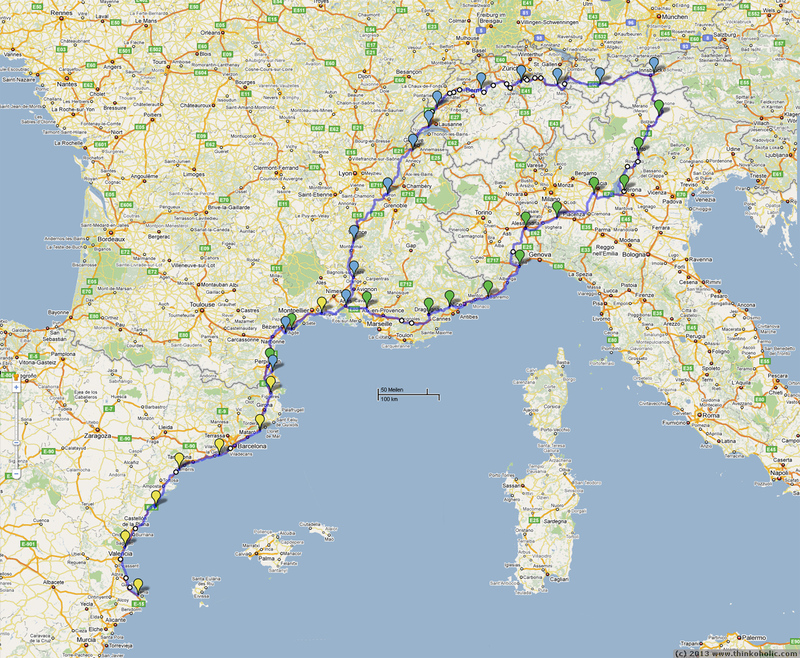 campground locations; from google maps) and about 10-12 kg of luggage per person. 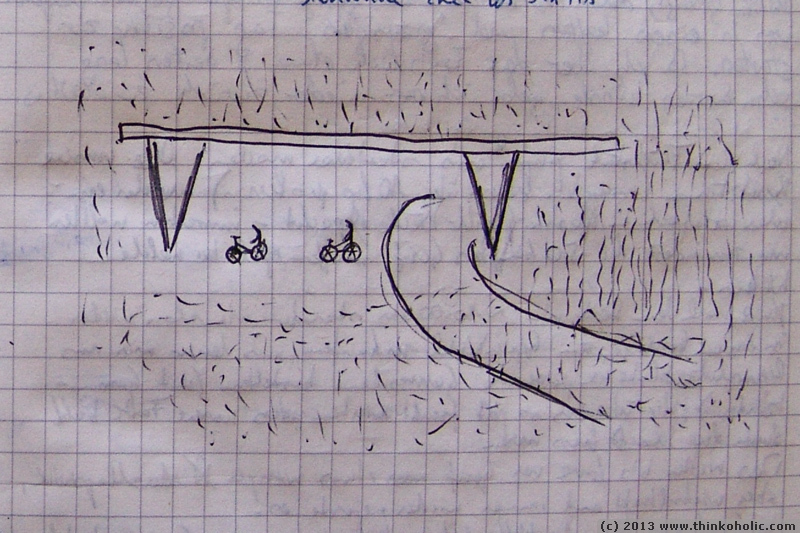 we shared the first 50 meters of our routes, and then turned onto different roads at the next intersection. 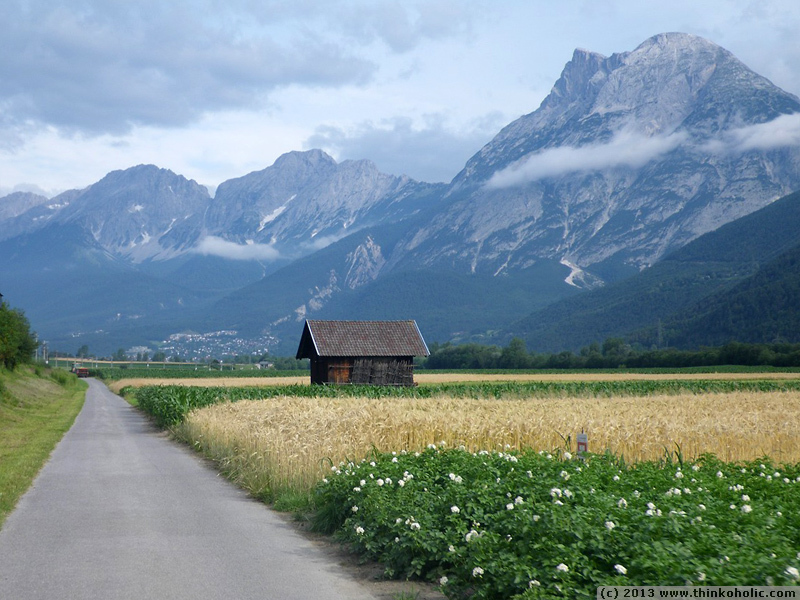 part 1 follows team two – anton and i – on our route from rum/innsbruck through western austria, liechtenstein and switzerland. we started the first day of our journey – also the first sunny day in two weeks – at 06:45 with a joint group photo at the doorstep. 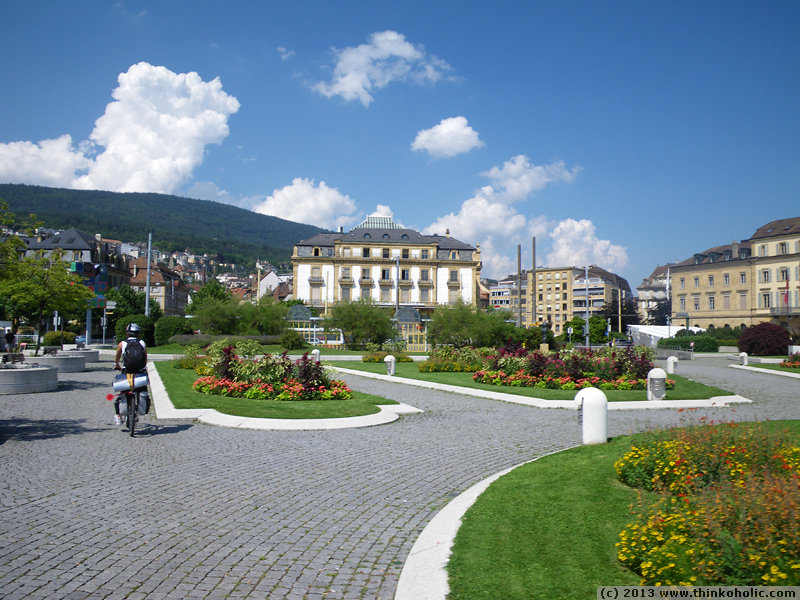 teams 1 and 2 parted ways about 20 seconds after setting out, and we (team two) interestingly ran into our first navigation glitch (a dead end) in the middle of innsbruck, 20 minutes later. 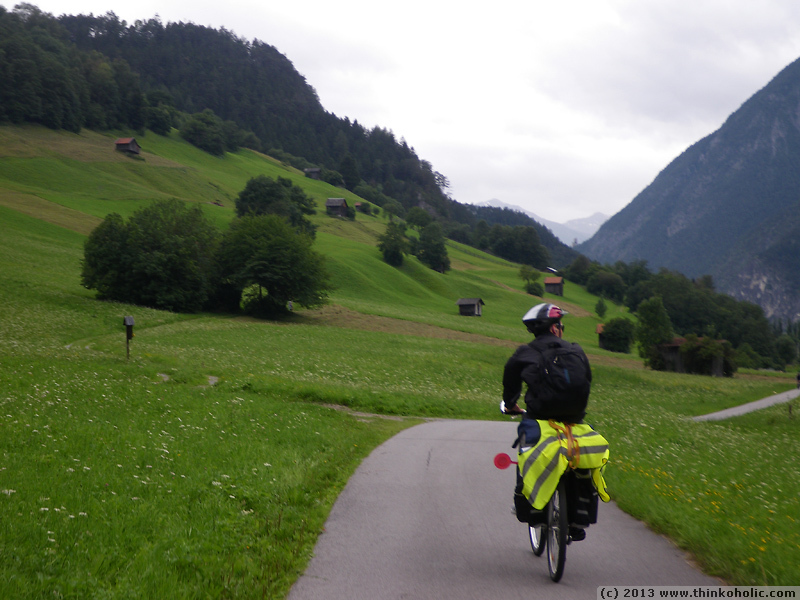 our route followed the beautiful inntal bike route to landeck, and continued towards st. anton am arlberg on stanzentaler landesstraße. 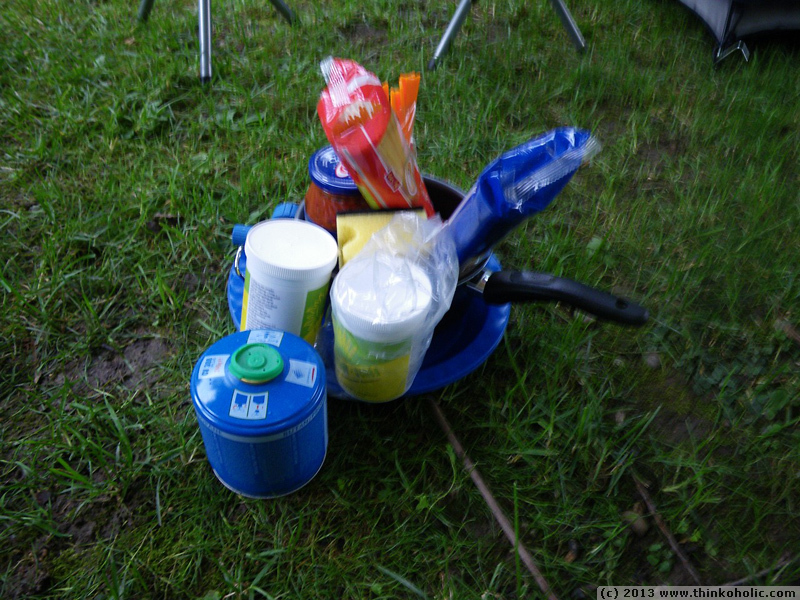 after almost exactly 8 hours of driving time, 117 km and 800 meters in altitude difference, we finally reached our first night’s accommodation, where we were welcomed with a home-made saussage, pasta and salad. 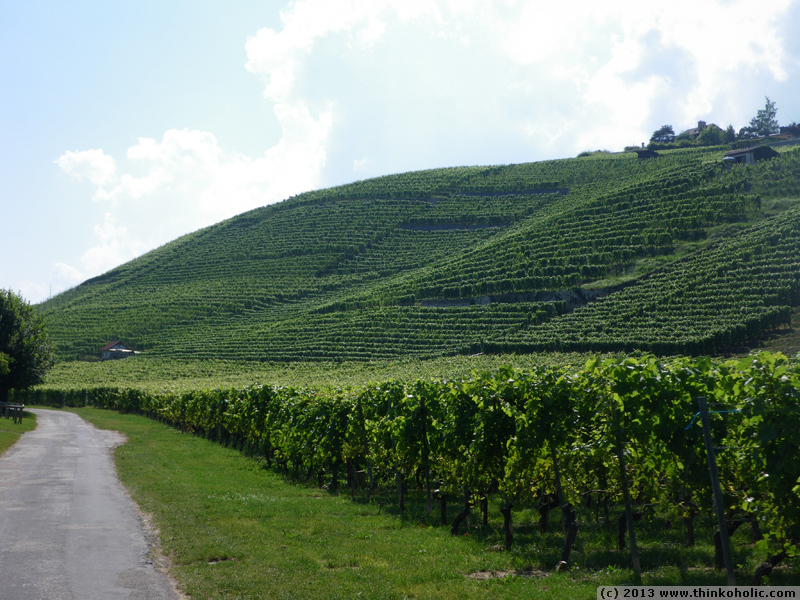 like father, like son (1/2) --see part 3, day 18 of the trip report! 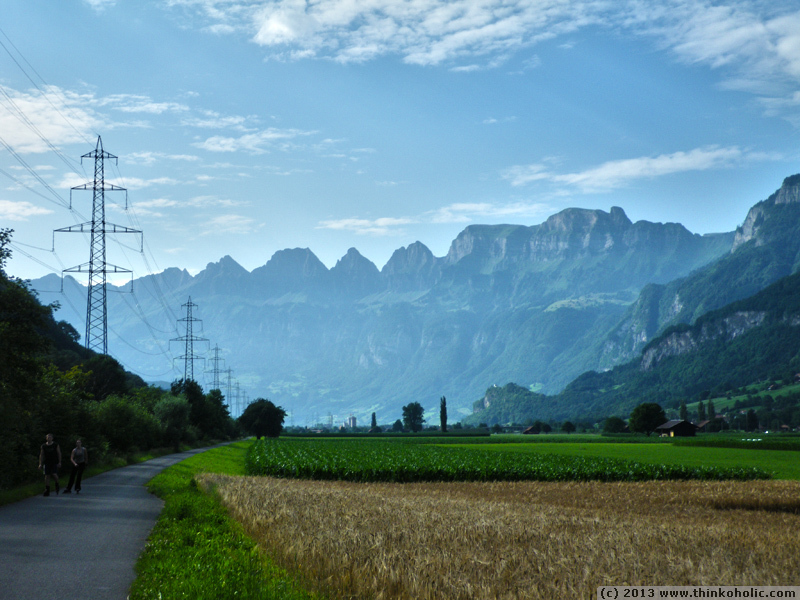 biking down arlbergstraße from beautiful st. christoph am arlberg. we reached 50+ km/h. speed flash photo after the steepest parts of arlbergstraße. note the small flies stuck to our faces and glasses. 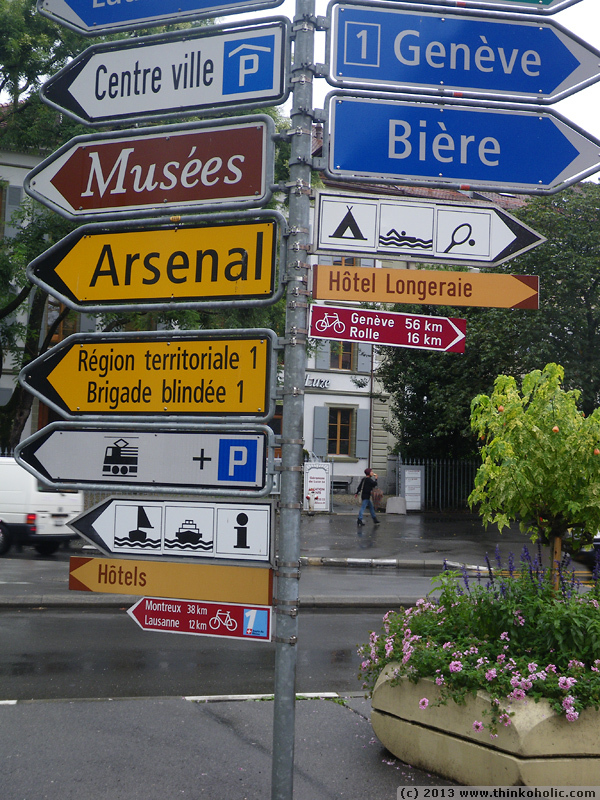 liechtenstein (FL) and switzerland (CH), this way. we did a much better job than the van trapp family, who walked right into germany in the musical! 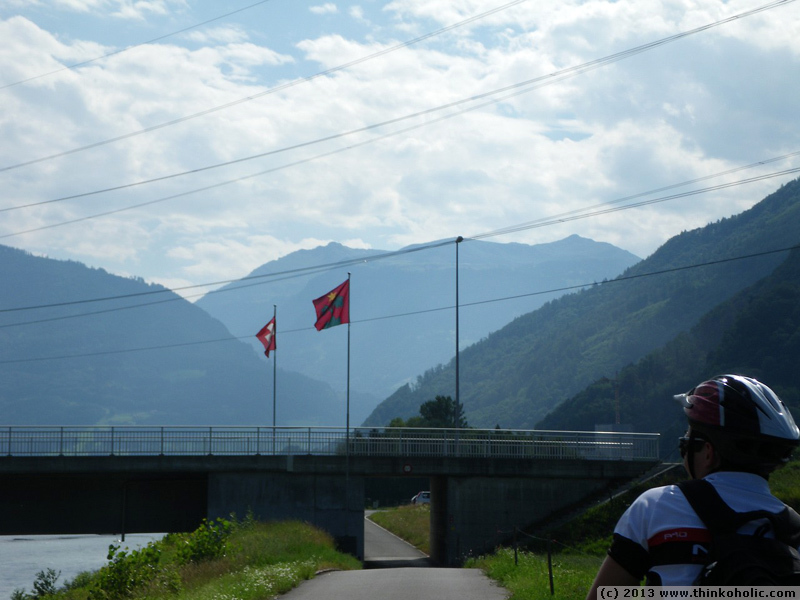 crossing the swiss-liechtensteinian border: rather unspectacular. 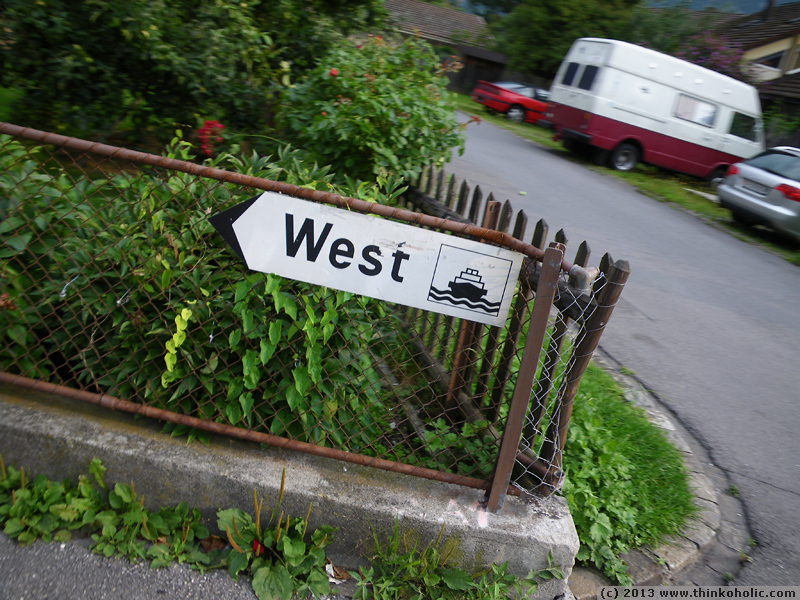 "go west" is exactly what we had in mind. 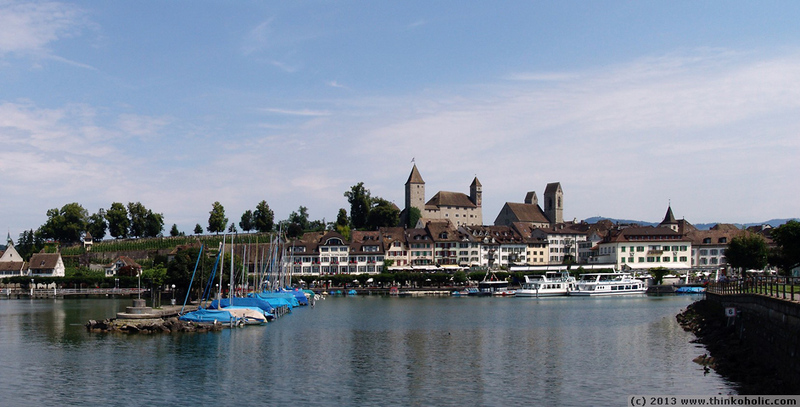 postcard #1: rapperswil, switzerland. 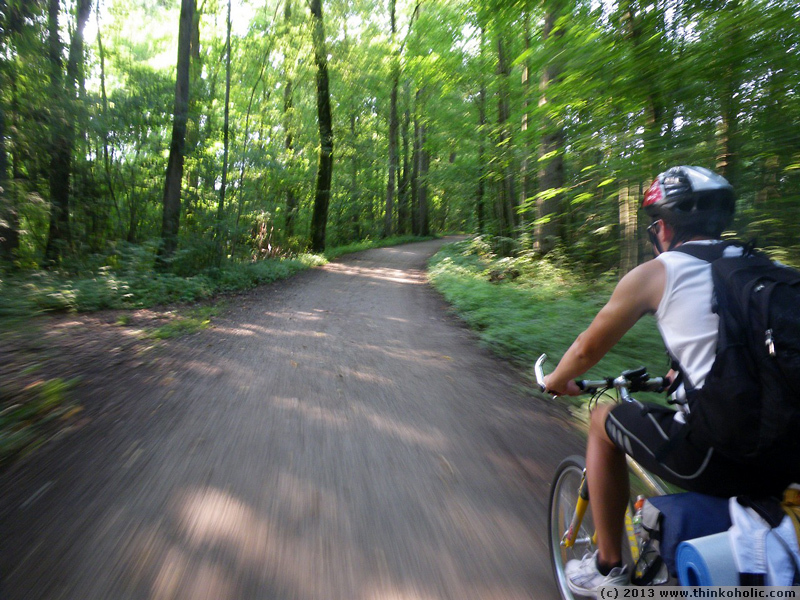 "we've already covered 281 km, so it's only a measly 1500 km to go". 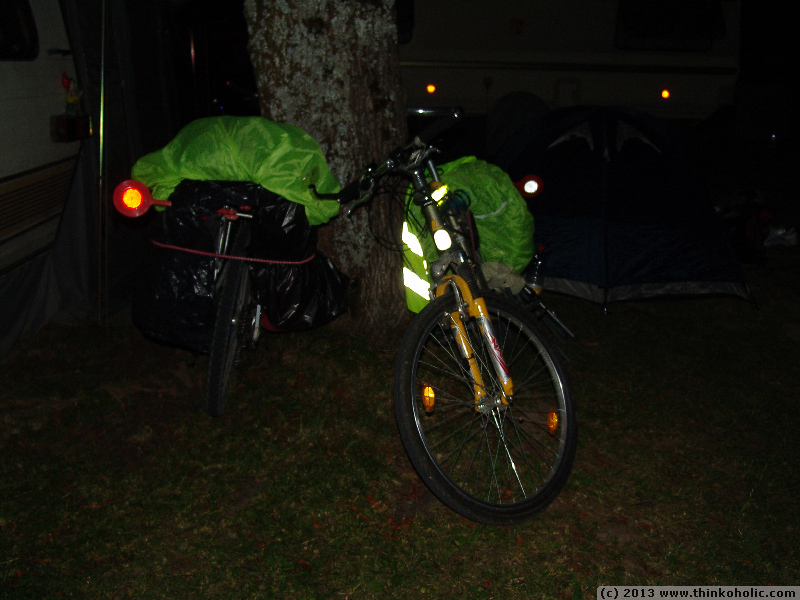 fully packed bike is ready to go! everything's waterproofed for the night. hopefully. 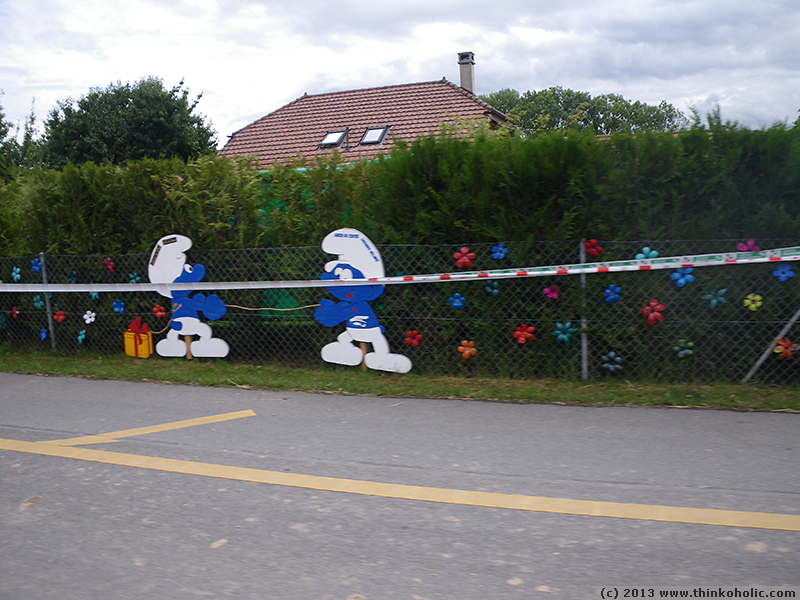 lussery-villars, an entire village covered in smurf decorations and fake flowers. 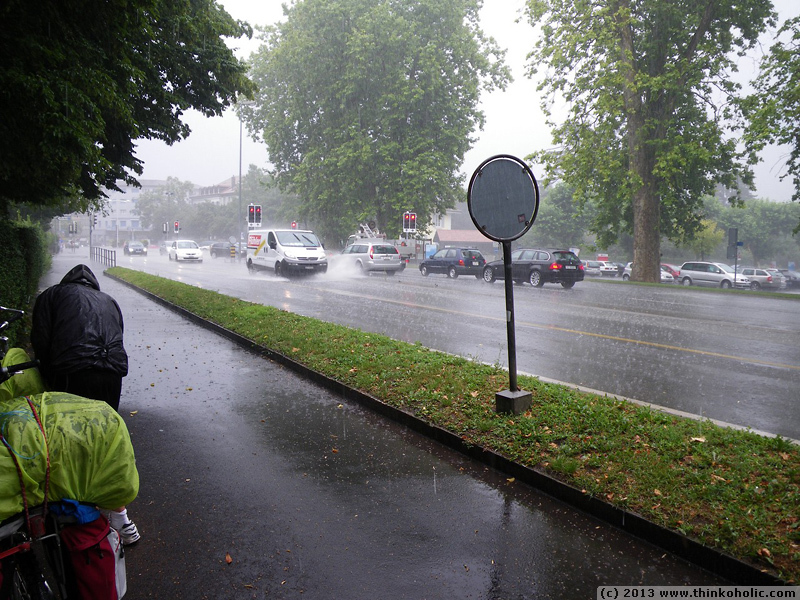 sudden rainfall in morges. we decided to go on. 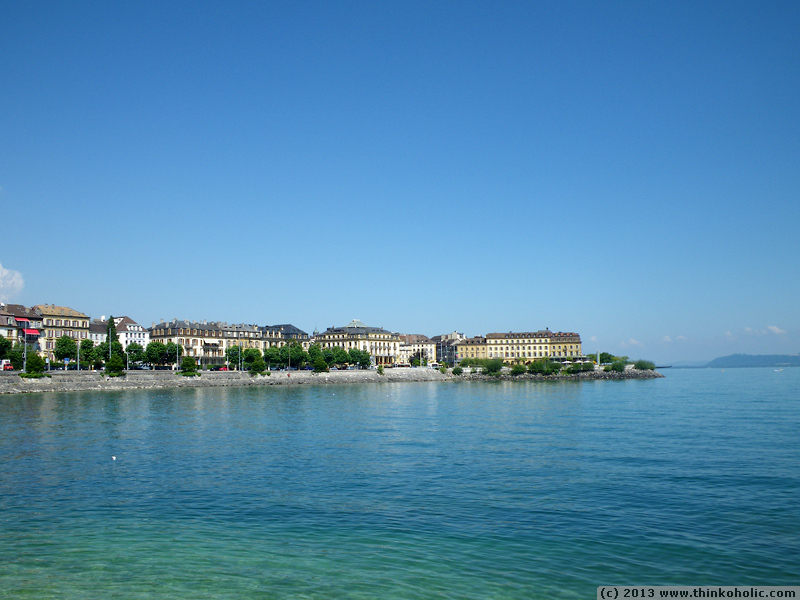 2.5 hours later, back in morges. we gave up. 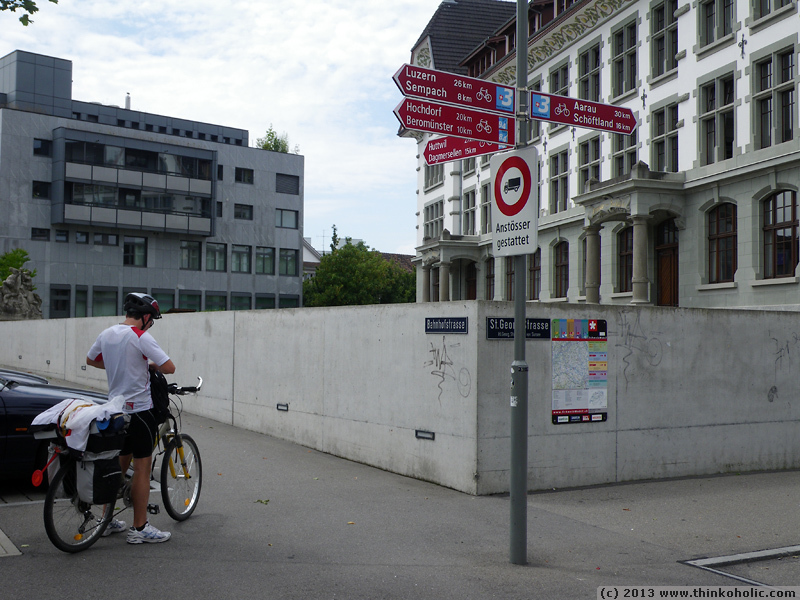 geneva: only 56 more kilometers by bike! day 7: after a comfy night indoors and tumble-drying of all our clothes, we ramped up the water-proofing. 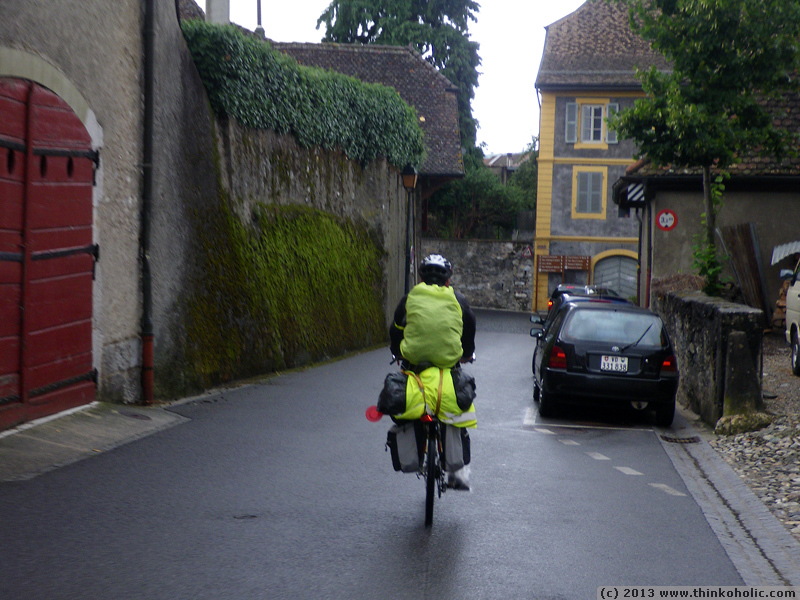 biking through buchillon with augmented water-proofing: everything (including stuff in our ordinary bags) was packed in garbage bags. the rain stopped. short photo stop at one of CERN's offices. too bad, it was a sunday. 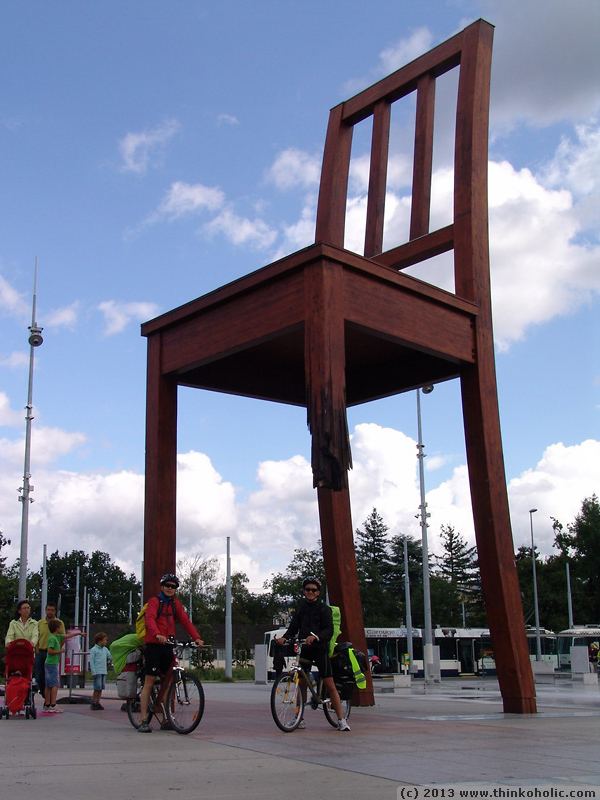 the broken chair, geneva, switzerland. with waterproofed bags and no rain near or far, we decided to make our work count anyways. 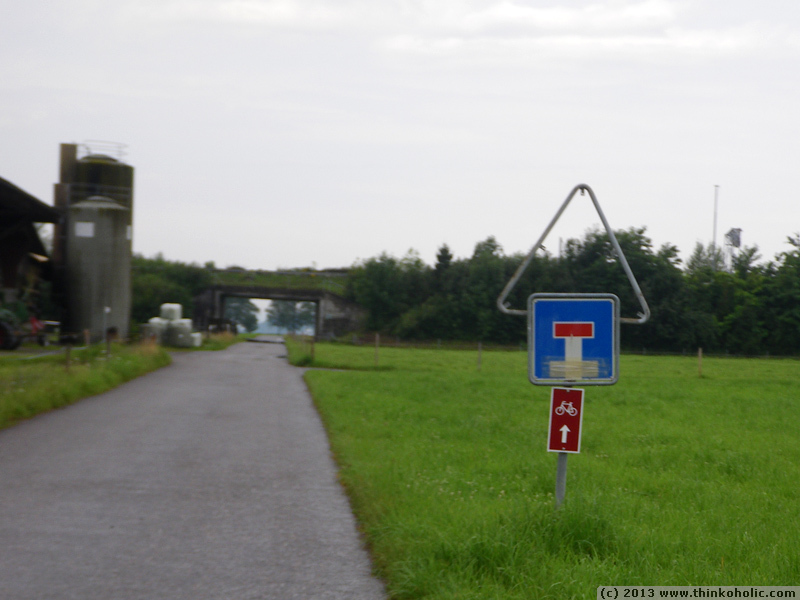 day 7: the swiss-french border, wildly unspectacular. 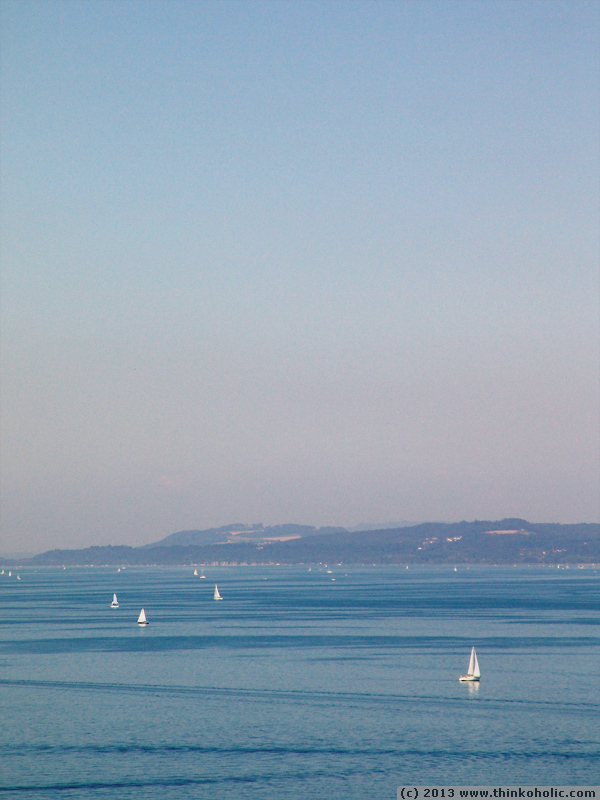 neydens, france. 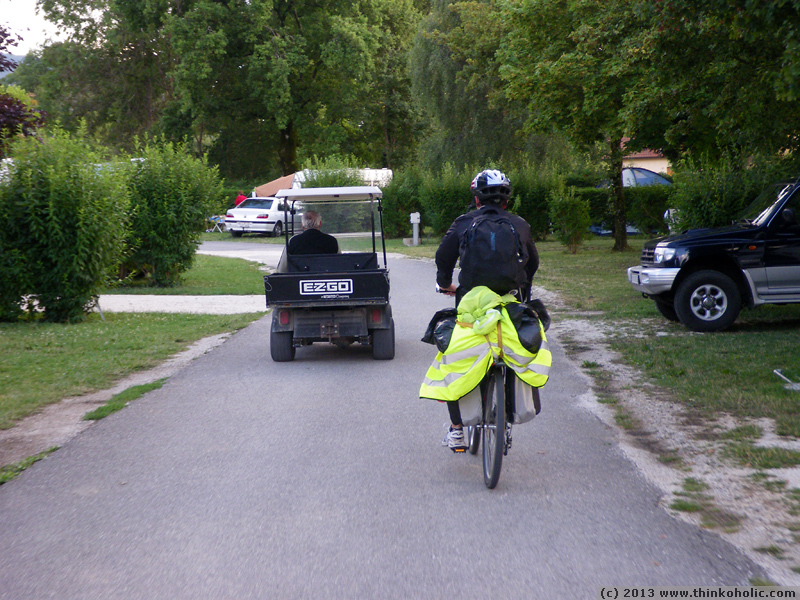 an elderly man in a golf cart leads us to our camp site. day two was, quite litterally, the high point of our trip: the ascent of another 350 meters in altitude brought us to the arlberg pass at 1800 m above sea level. feeling of accomplishment! 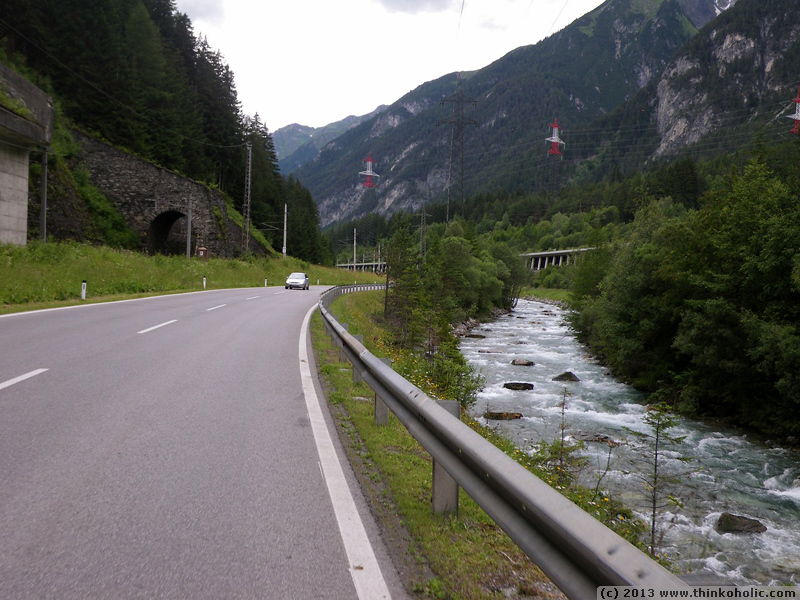 what followed was unbelievably refreshing: going down the main road on the other side (including a few tunnels), with an average speed of 50 km/h. we didn’t realize this until we were home again, but our “after-descent” photo shows a bunch of insects stuck on our foreheads. 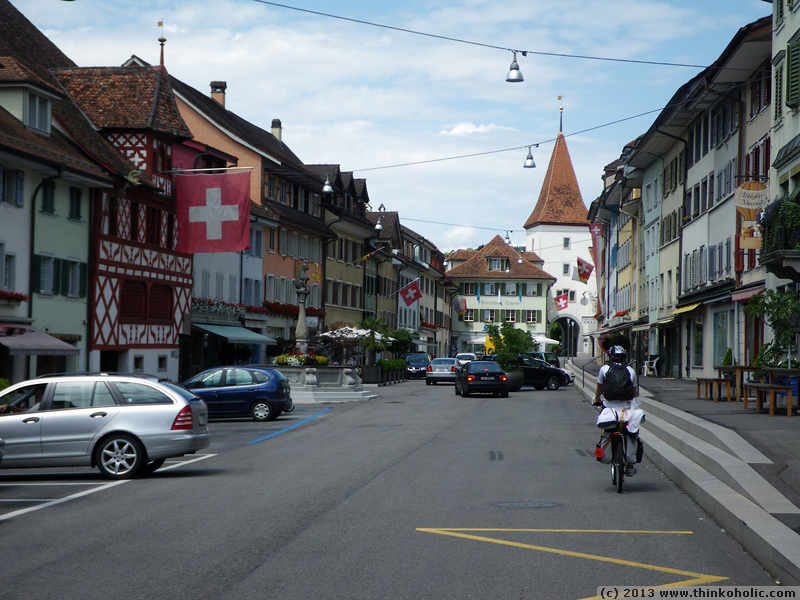 we met our friend nicole in feldkirch for a quick banana split and mango juice (read: fuel), and headed on to liechtenstein – a country the size of a big towel – to follow the rhine river south. 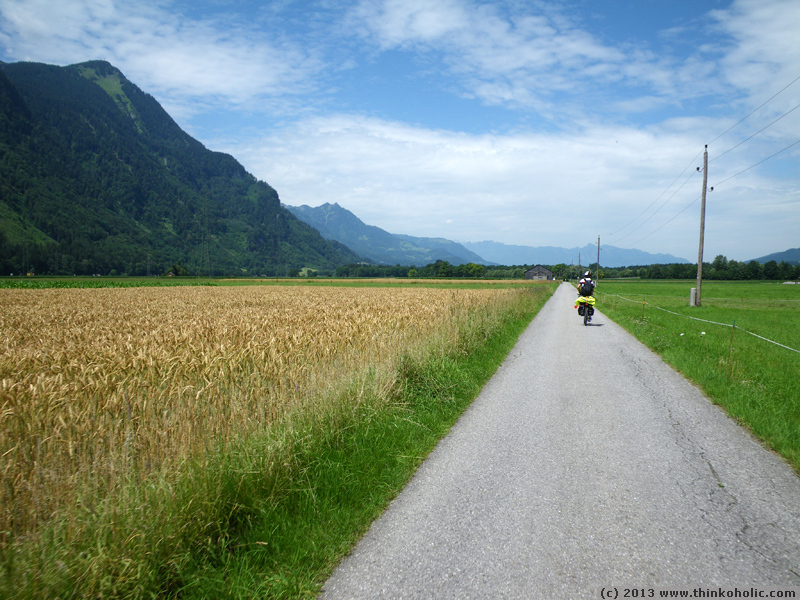 30 minutes later we were already biking in switzerland. 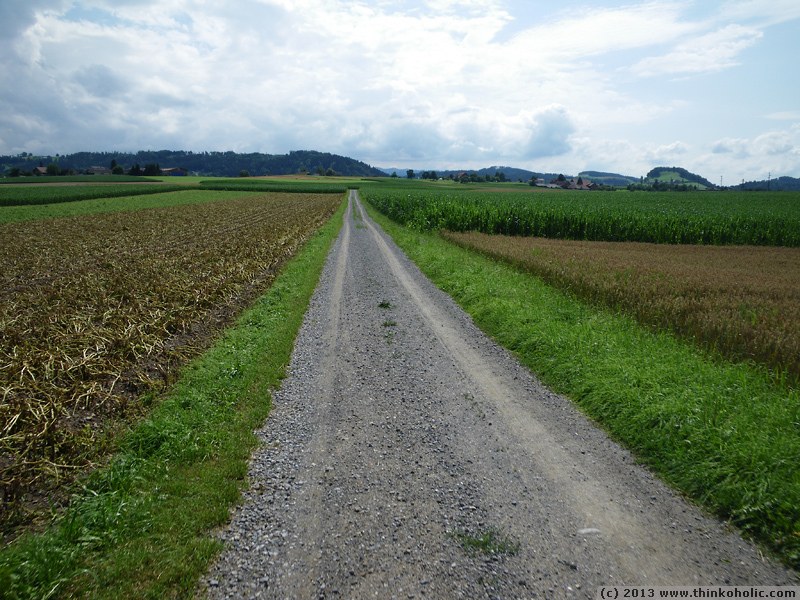 both borders, the one between austria & liechtenstein, and liechtenstein & switzerland, were so unspectacular that we had trouble noticing them at all. 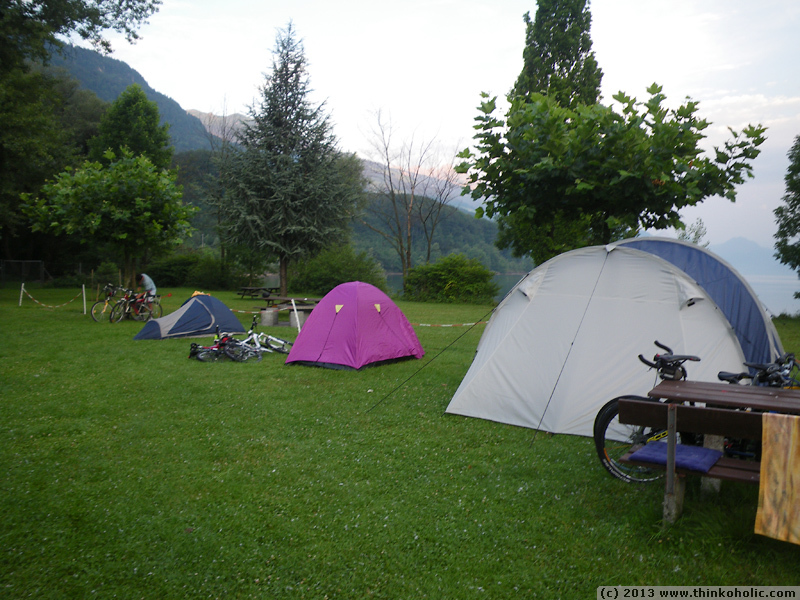 our spot for the second night was a lakeside campground in walenstadt, switzerland, where we discovered that (1) our small tent really was tiny, and (2) our noses had caught quite the sunburn. the third day into our journey, we realized that we hadn’t taken the worst case weather scenario very serious. we headed out at 07:30 am, and quickly ran into the first of several rain showers which repeatedly forced us to seek shelter. 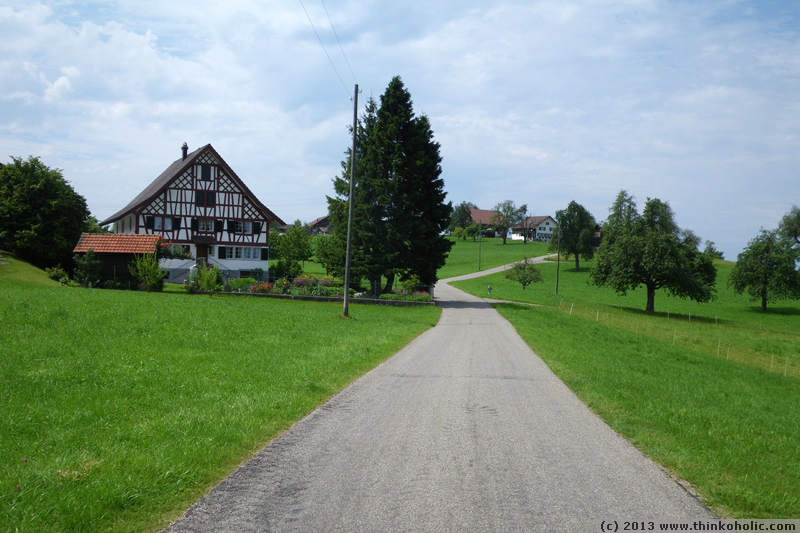 the route between rapperswil, hirzel, baar zug and cham was both very picturesque and very hilly. 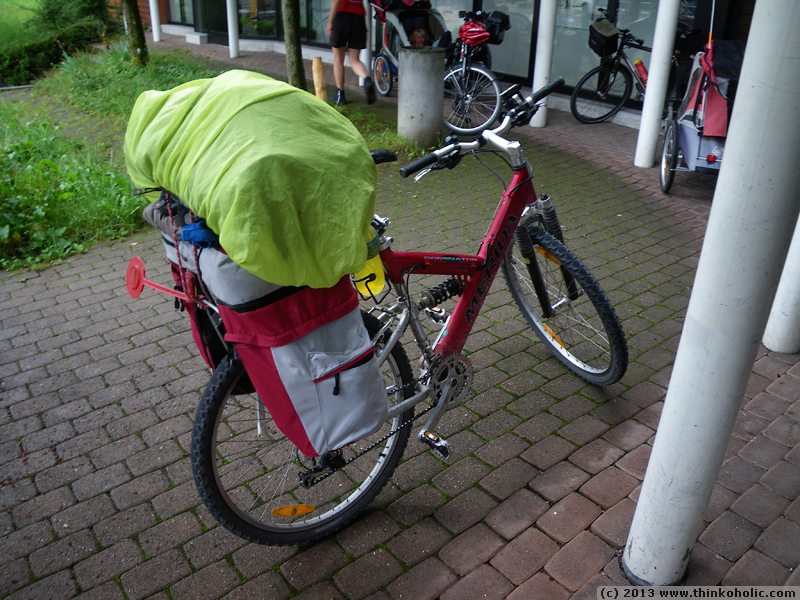 due to the weather, we spent the night at a youth hostel in zug. 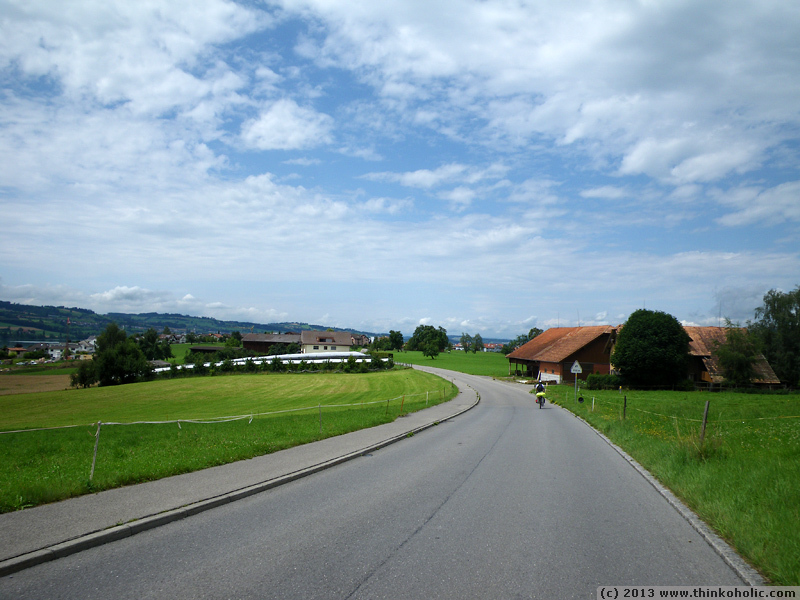 the rest of the day, we completed the route to sursee, hüttwil, and eventually burgdorf. 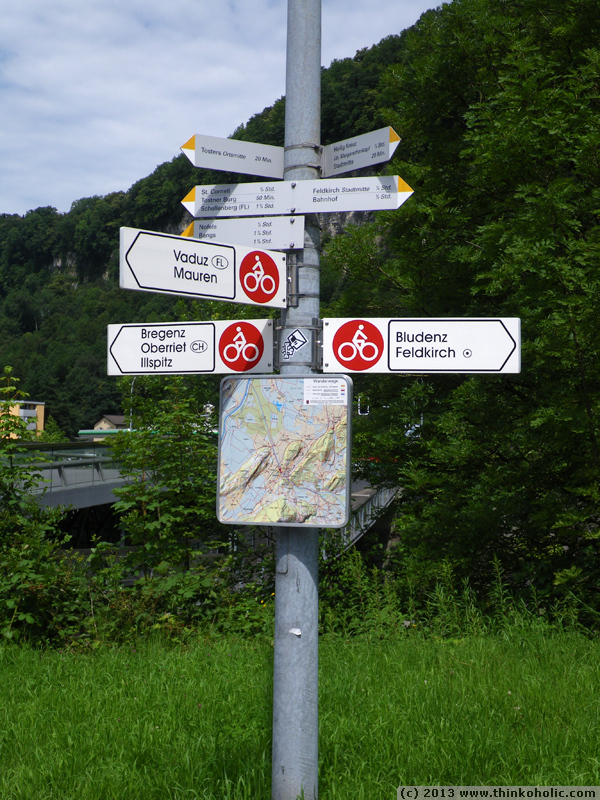 if you think you can understand swiss german, try asking for directions at veloplus in emmen (near the train station). we asked staff and, since we couldn’t understand anything, had them show us twice on a map. back outside, we quickly exchanged what little chunks either of us had understood. in the middle of the night, anton’s head went searching for a better substitution for a pillow, and apparently found my right arm quite suitable. the following morning, i asked “did you really sleep on my arm last night?”, and we couldn’t stop laughing. 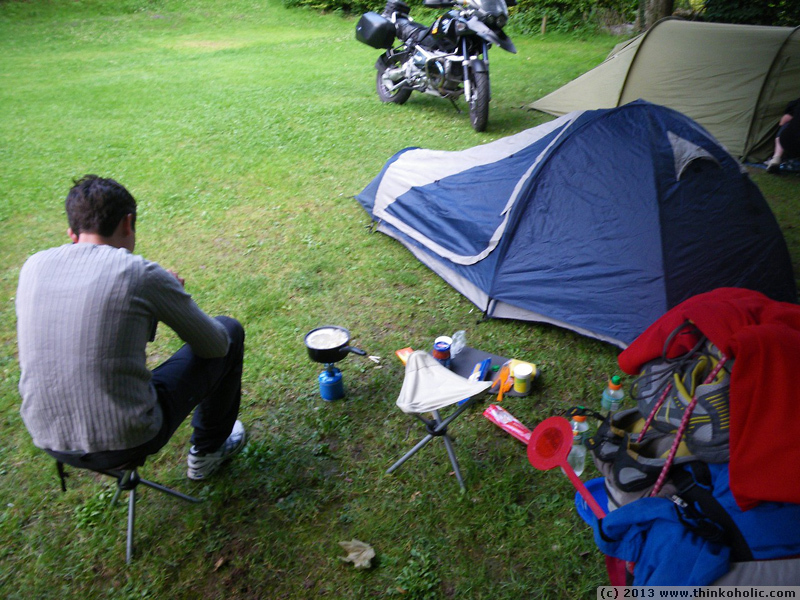 special bonus: a tour of our extensive estate on the campground. burgdorf was our first town with a documented chocolate croissant breakfast (available in the bakery as “schoggli-gipfeli”). we bought one chocolate-filled croissant per person. 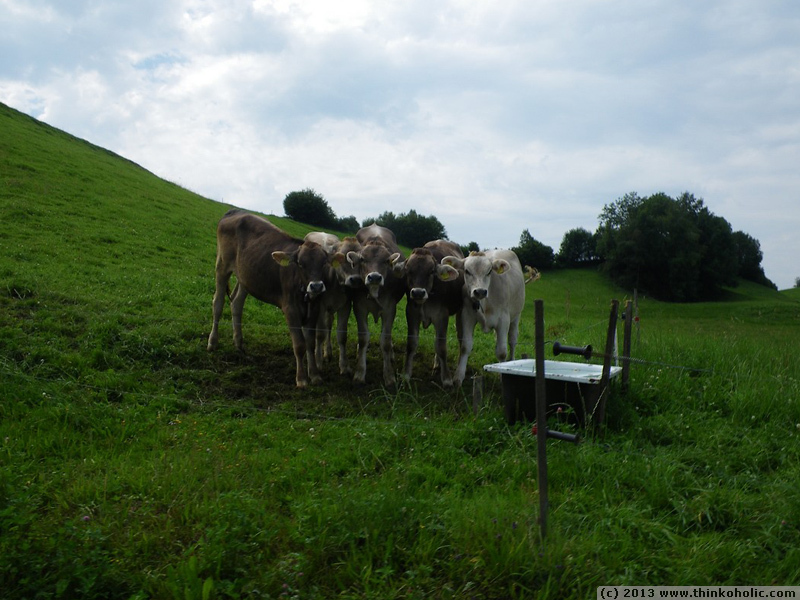 by the end of our tour, we had moved up to a family pack (i.e. 3 croissants each). another case of “let’s just go on and find our route on the way” finally taught us that it’s better to turn around sooner when disoriented. we took a little detour to neuchatel to check out an exhibit in the natural history museum (featuring my frog spawn time-lapse). quite fascinating: as we crossed the canal de la thielle into the next canton, the main language changed instantly from swiss-german to french. 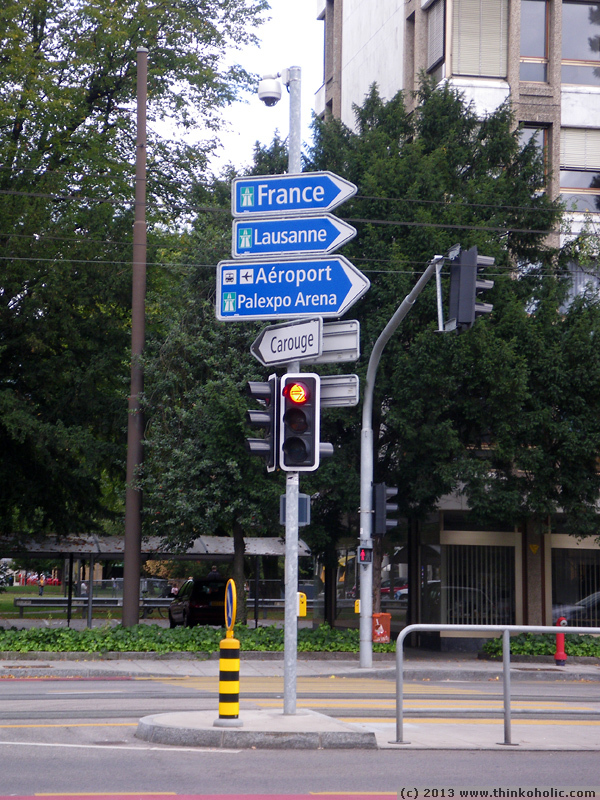 suddenly, we were in the french part of switzerland, and hardly anybody understood german. 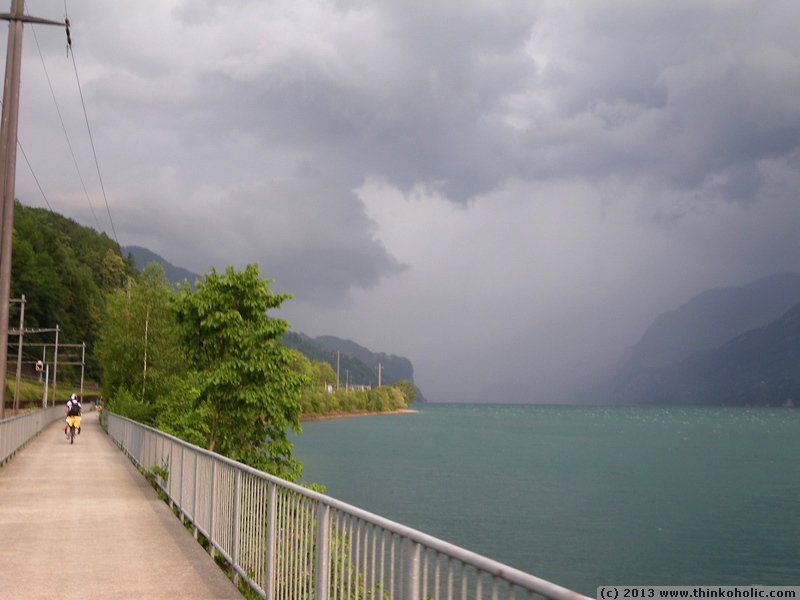 the day ended with heavy thunderstorms and lightning from midnight until the morning. our tent proved waterproof. a little old lady in a bakery whispered the correct response to me when i couldn’t remember how to reply in french. the ratio between liquid drunk and pee stop frequency only made sense if we assumed a transpiration loss of at least 1 liter per day. 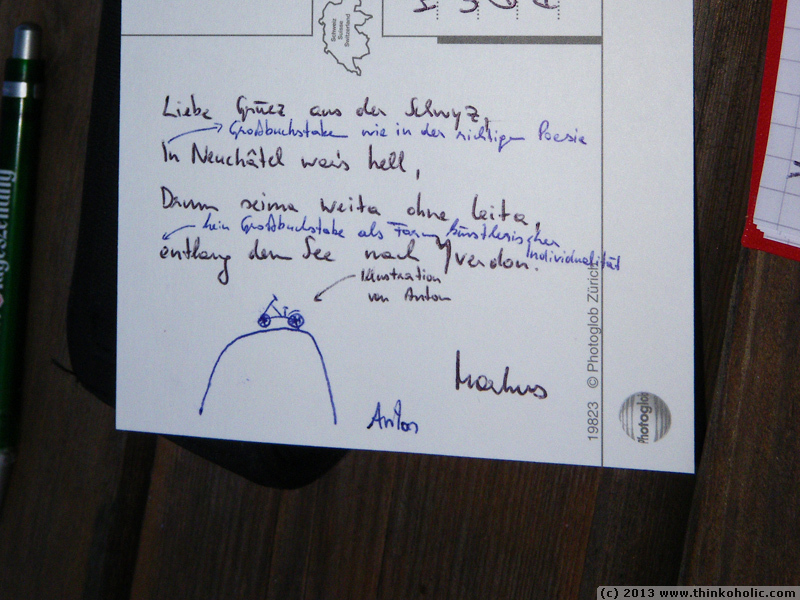 our hypothesis that the german-swiss will reply nicely when greeted with one of two code words (“hoi” or “grüezi”) held up. we it thoroughly on 75+ locals over 5 days. 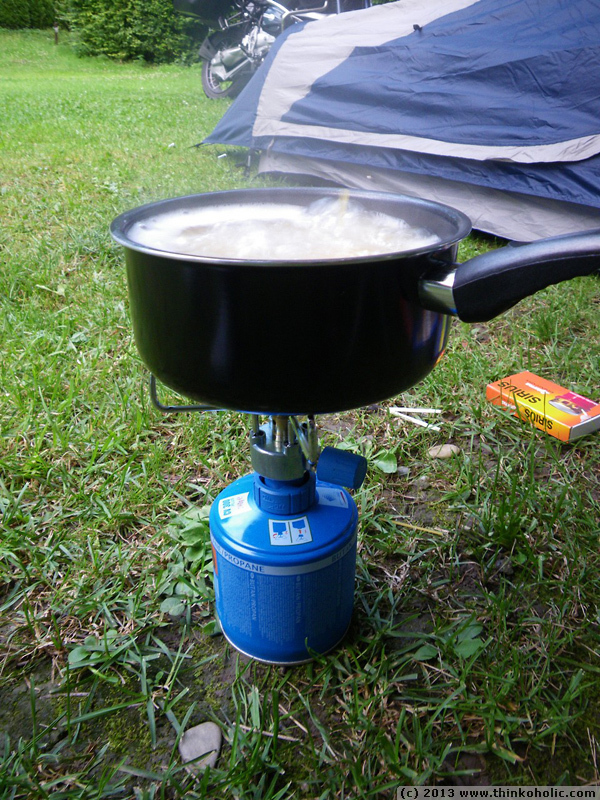 we’ve set up camp in the middle of a caravan landscape, and our tent is about 70 cm tall. the train passes through every 5 minutes. directly through our tent. 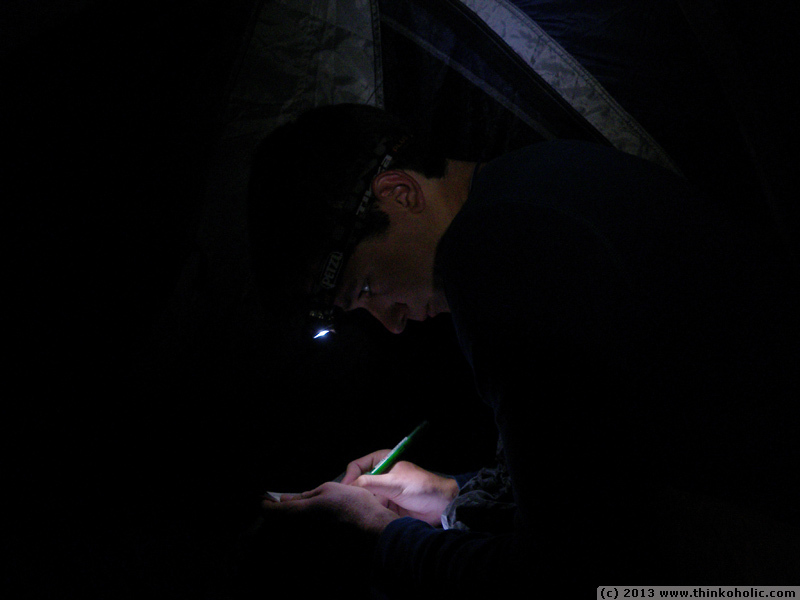 a car’s headlamps fooled us into waking up and thinking it was morning already, at 10:15 p.m.
our tent is home to a small but nice petting zoo of insects, including female mosquitos and life-like grasshoppers. 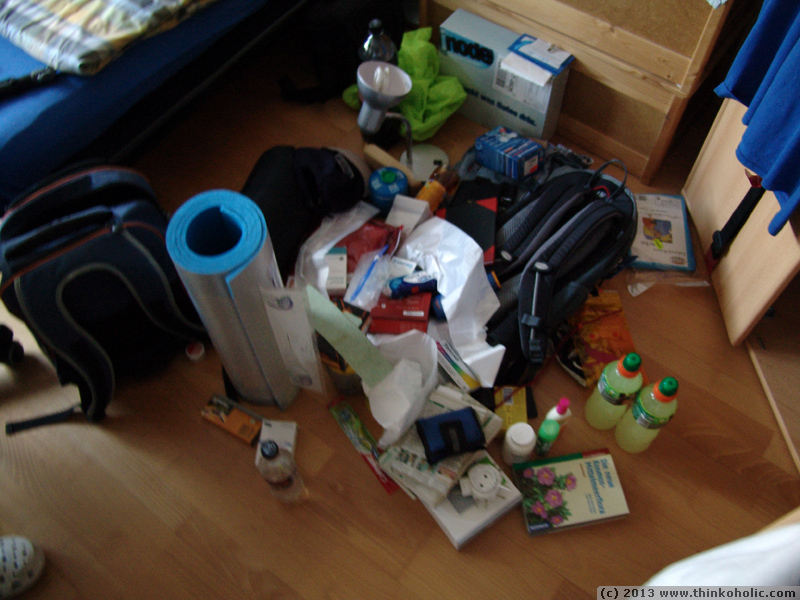 also: i had to tighten my backpack’s hip belt, helmet strap and even my glasses’ temples. am i losing head-fat? what was doubtlessly the wettest day in our entire bike adventure, started with two hours inside the tent, waiting for the heavy rains to subside. 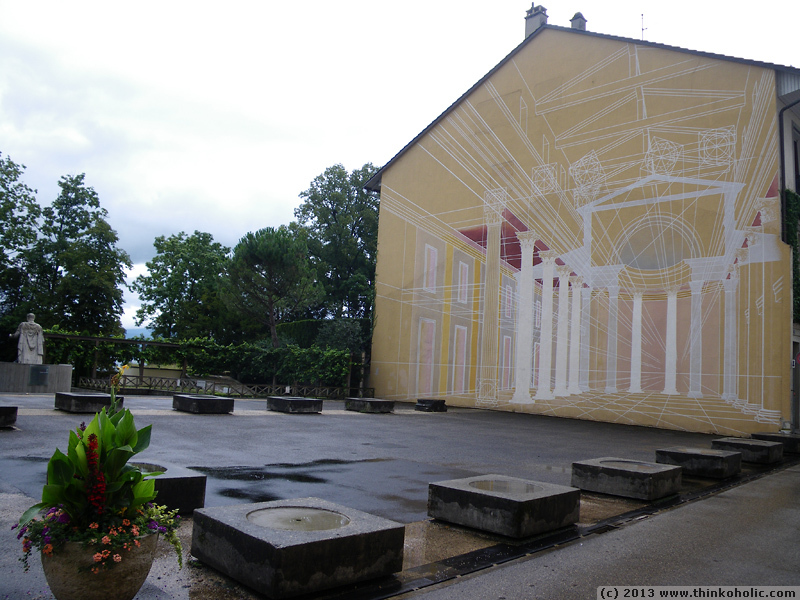 with a wet packed tent we continued (+had a breakfast of “cornets de la crème” along the way), and only got to morges until the downpours started again. 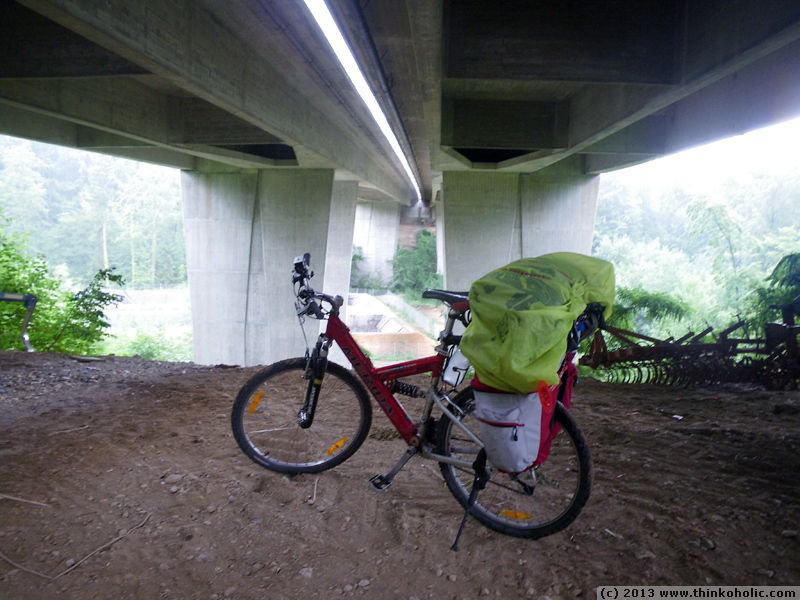 we didn’t want to give in that quickly, and started again at the next sign of lighter rain, only to end up a few kilometers ahead, seeking shelter under a motorway bridge. 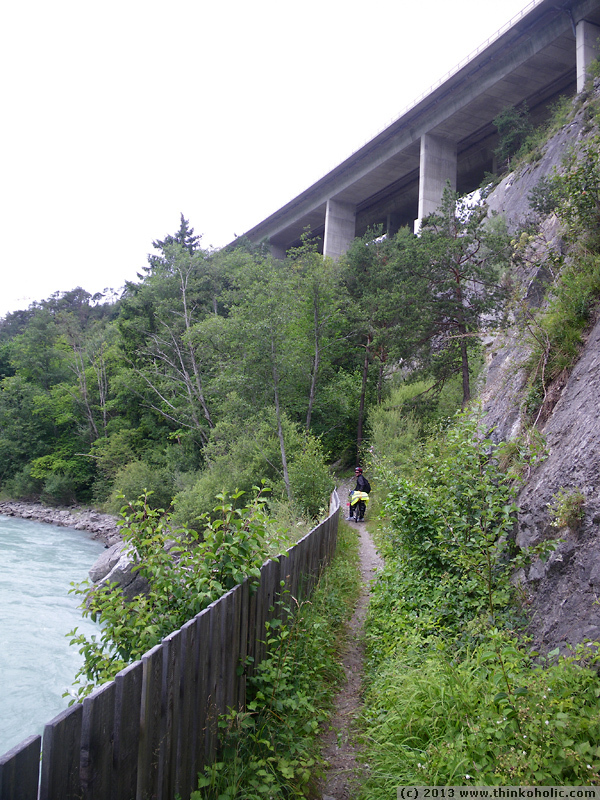 after yet another attempt, that had us return to the same bridge, we biked back to morges’ tourist info, where we entered dripping wet, cold, and with flashing bike lights on our clothes and backpacks, looking for a place to stay. on the way to our not-so-cheap private accommodation for the night, in saint-prex (another 6 wet kilometers), we noticed the close correlation between bikers’ greetings and the weather: the more it was bucketing down, the more every biker we encountered (including ourselves) waved happily and greeted loudly, encouraging each other to keep up. 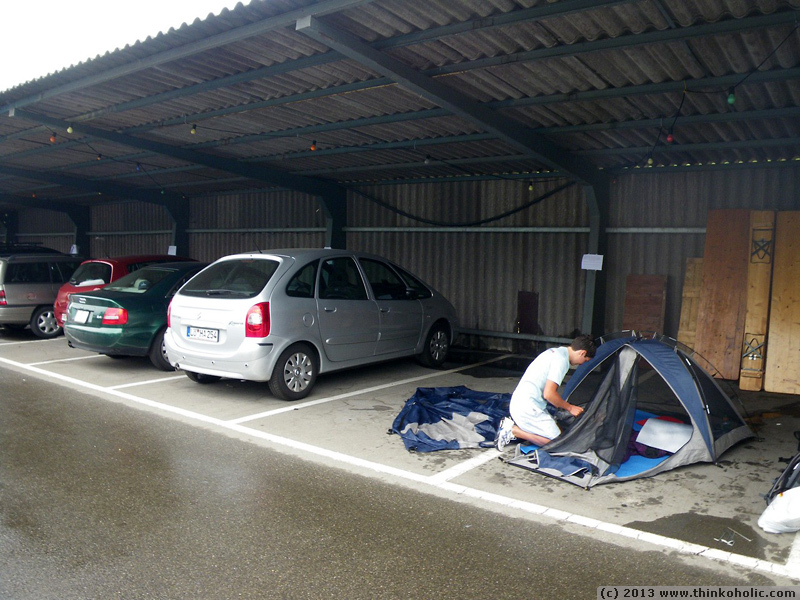 the highlight of day 6 was, when our hosts claire and jean-luc (aux 4 saisons) offered to tumble-dry our clothes. oh, how we enjoyed the warm fluffiness that was returned to us! day 7: another rainy morning, another extra hour of sleep. temperatures had dropped by about 15 °C degrees over night. our mood brightened up immediately, though, as we reached a breakfast table full of delicious home-made and regional products. 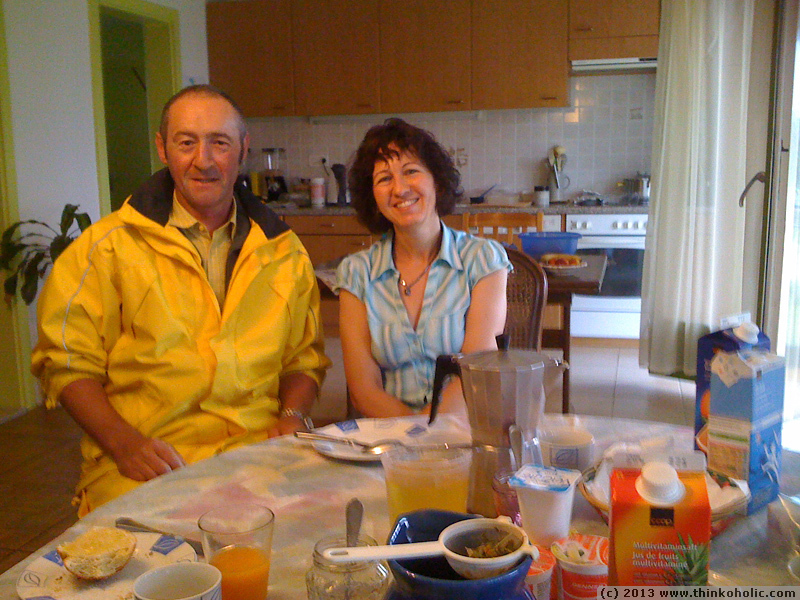 our host jean-luc reminded us a lot of kad merad as the postman in “bienvenu chez les ch’tis” – even more so, when he told us he was going out to deliver the mail! 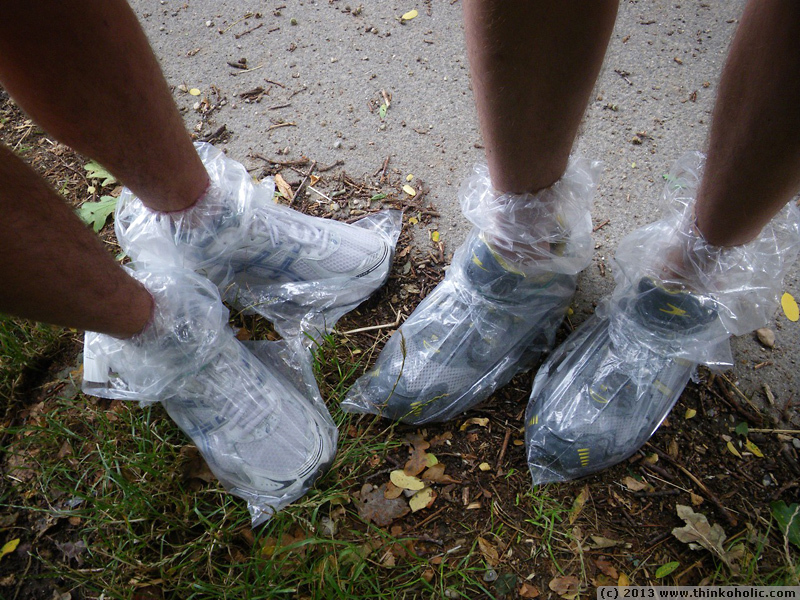 after our rainy experience, the day before, we ramped up the waterproofing and wrapped EVERYTHING in plastic bags – including our shoes. from that moment on, the rain was (more or less) gone. 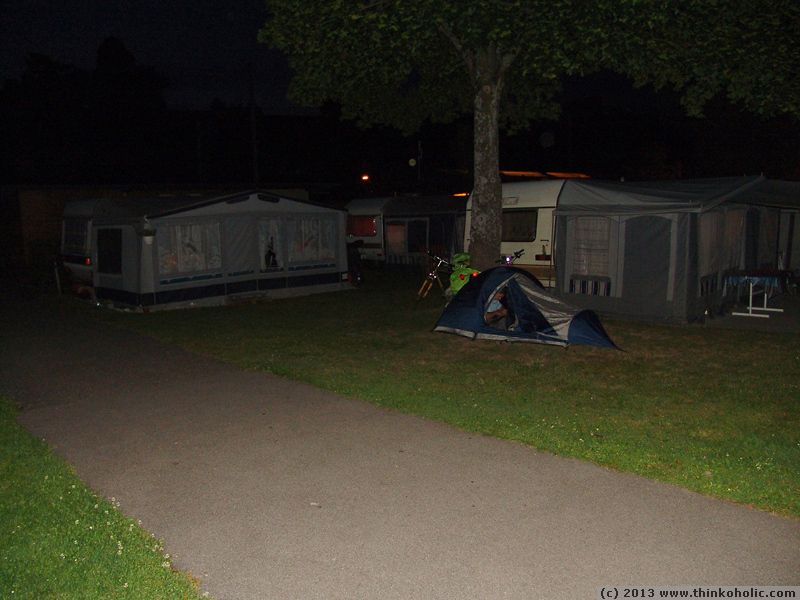 a few kilometers outside of geneva, we found our night’s campground (and a crazy old woman, sitting by the side of the road and immitating us in a lightly disturbing way) in neydens, france. anton, remember the old woman! 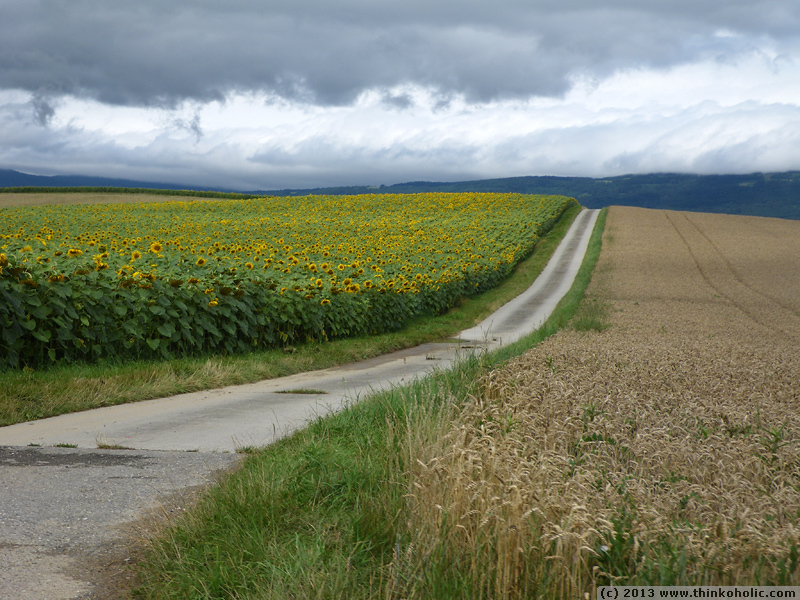 continue to part two, and read about our route from neydens (swiss border) to arles, an unplanned family reunion, and the journey along the coast to saint-cyprien and the spanish border!